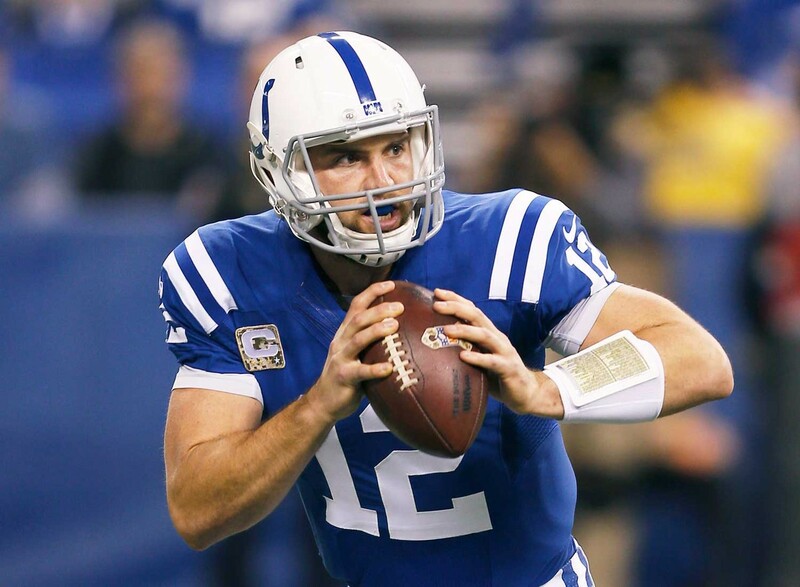 Published: Nov. 20, 2014 at 05:38 p.m.
Luck has chance to be the wire-to-wire scoring leader among all fantasy players. A matchup against the Jaguars, whom he lit up for 370 passing yards and four touchdowns in Week 3, will help further that cause for Luck. This stat gets more and more ridiculous each time I look at it: Over the last three games, Tom Brady has completed 22 of 24 passes (91.7 percent) to Gronk for 325 yards and five touchdowns. It almost feels like Graham is having a bit of a down year, even though he's on pace for 94 receptions, 997 receiving yards and 11 touchdowns. With Brandin Cooks now on IR with a broken thumb, the Saints will need Graham more than ever. Charles' five straight games with a rushing touchdown is the longest active streak in the NFL currently, and the Chiefs are 6-0 when Charles has a rushing touchdown this season. Look for them to make it 7-0 on Thursday Night Football. My goodness, what a run Rodgers has been on. You've seen all the stats by now, but here's one more for you: Since Week 4, Rodgers has completed 70 percent of his passes that travel 20-plus yards in the air. That's insane. Thomas currently ranks second among all wide receivers in receptions (72) and yards (1,105) on the season. Coming off a bad loss to the Rams, Thomas and the Broncos offense could explode at home against Miami. Murray has scored fewer than 13 fantasy points just once this season, and scored 19.20 the last time the Cowboys faced the Giants. He'll be relatively fresh coming off of a bye week, too. Forte is having a quietly remarkable season. He's on pace for 107 receptions which would be the most ever by a running back, and if he picks up his yardage pace a bit he could become just the third player in NFL history with 1,000 rushing yards and 1,000 receiving yards. Fantasy owners breathed a collective sigh of relief this week when Thomas' ankle sprain wasn't deemed serious. While he might not post the reception or yardage totals of Graham and Gronk, Thomas' touchdown-scoring prowess is evidenced by his league-leading 12 scores. Of the 24 players with 50-plus receptions, Nelson has the highest yards per catch average with 16.6. He's also one of only three players in the NFL with 900-plus receiving yards and at least nine touchdowns. The seven points the Broncos scored last week were the fewest by Denver with Peyton Manning under center. Manning has thrown multiple interceptions in his last three games, a streak he'll look to break on Sunday. Bryant has been much better with Tony Romo under center this season, catching 65.9 percent of his targets as opposed to the games where Brandon Weeden was playing. The bye week should have done wonders for both Romo and Bryant heading into their matchup against the Giants. Even though the Saints lost last week, Brees posted a pretty good stat line completing 33 of his 41 attempts (80 percent) for 255 yards, one touchdown and no interceptions. The Saints' playoff hopes are hanging in the balance, which could lead to Brees slinging it even more to help push the team into the postseason. Even though he's missed two full games with injuries, Foster still accounts for 29 percent of the Texans scrimmage yards -- the fourth-highest mark in the NFL. It sounds like Foster will be a game-time decision, but if he goes he's a must-start in fantasy. After a rough start to the season, Tom Terrific has 20 touchdown tosses and just three interceptions in his last six games. Everyone who proclaimed him to be "done" really needs to be ashamed. If Gates catches a touchdown pass this weekend, he will become the first tight end in NFL history with four seasons of 10-plus touchdown receptions (Gronk could also accomplish this if he scores this weekend, too). Despite all of the ballywho early this season about Lacy as a "bust" and in a "sophomore slump," the Alabama product has been dominant in recent weeks and is currently seventh in fantasy scoring among running backs on the season. That's helped in large part by his 322 receiving yards (65 more than he had last season). Since returning to action in Week 9 after his toe injury sidelined him for three games, Green has hauled in 12 receptions for 194 yards and two touchdowns. He should be able to take advantage of a suspect Houston secondary on Sunday. Since returning from a broken hand that sidelined him for several weeks, Ingram has posted four consecutive weeks with nine or more fantasy points, including two 23-plus point efforts. His matchup against Baltimore isn't ideal, but Ingram has busted "bad" matchups before. Marshall's 31 receiving touchdowns since 2012 are third in the NFL behind only Jimmy Graham (32) and Dez Bryant (33). The Chicago offense found a bit of a groove last week. Hopefully they can carry that into their matchup with the Buccaneers on Sunday. To say McCoy has been a disappointment on the season might be the understatement of the century. He's 16th in fantasy scoring among running backs, but was drafted with one of the first few picks in most leagues. He is trending upward, however, with three double-digit performances in his last five games. Given the disparity at the tight end position outside of the top three (Gronk, Graham, Thomas), it's not surprising to see Donnell so highly rated for the week. It also helps that Dwayne Allen is dealing with an ankle injury. Kaepernick has been a far cry from the fantasy superstar many expected him to be when they drafted him back in August, but a matchup with the porous Washington secondary could be just what the doctor ordered. They've allowed a 104.3 passer rating to opposing signal-callers, the third highest mark in the NFL. Megatron was limited by Patrick Peterson last week, and it appears that our experts are worried the same thing could happen against Darrelle Revis on Sunday. Megatron is pretty matchup-proof, though, and if he's on your fantasy roster there's no way he sits on Sunday. BeastMode has had quite the season, but was kept out of the end zone by the staunch Kansas City defense last week. With a critical NFC West game taking place against the Cardinals in Seattle on Sunday, look for the 'Hawks to ride Lynch to wear down the Arizona defense.